This complete dining set features your choice of stationary or swivel rocker high back dining chairs. Designed for exceptional comfort during meals and meticulously handcrafted to provide maximum longevity, the chairs feature quick-drying sling fabric and extended backs that offer extra lumbar support. 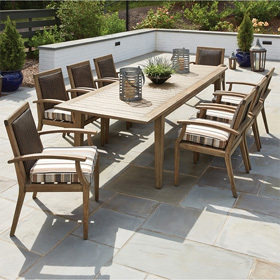 A cast top table that accommodates four individuals completes this arrangement from Woodard. Dining Table 48"Rd x 27.5"H 81 lbs.